Notes: 1 silver albumen print; 12 x 20 cm. Notes: Architects: Machinery Hall, Henry Pettit & Joseph M. Wilson ; Pennsylvania State Building, H.J. Schwarzmann & Hugh Kafka; Ticket office, H.J. Shwarzmann. Notes: Machinery Hall with Bartholdi's fountain. Lamp-lined walkways, pedestrians, a ticket office, pond and Pennsylvania Building in surroundings. Tower in background. 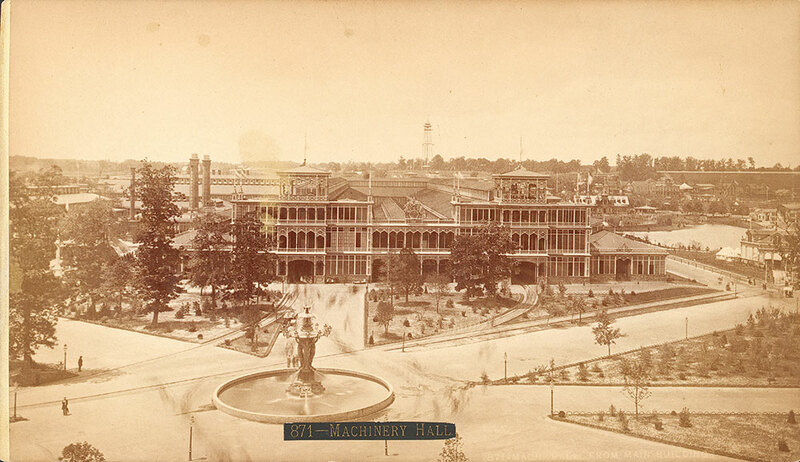 Notes: Titles on label: Machinery Hall; Mach: Hall, from Main Building.